His Holiness Pope Francis called on President Maithripala Sirisena at the Presidential Secretariat this evening, where bilateral discussions were held between them with the sharing of good wishes. Later, Prime Minister Ranil Wickramasinghe joined the discussion with Pope Francis and President Sirisena. After this discussion, His Holiness and the President came to the hall which had a gathering of special invitees for the occasion, where the exchange of gifts between the Pope and the President took place. President Sirisena gifted the Pope with a “Ran Kendiya” a gilded ornamental jug with handle and spout, richly engraved in traditional designs, typical of such vessels used in the royal courts of ancient Sri Lanka. 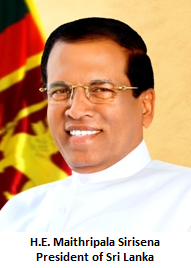 Pope Francis gifted President Maithripala Sirisena with a copy of the Nautical Atlas attributed to Bartolome Oliva, drawn in 1562, which has 14 Nautical Maps in colour of Asia and Europe, including a very clear map of Sri Lanka at that time. This gift has facsimiles from the original atlas at the Vatican Apostolic Library, Urbinate Latino. After this, a commemorative stamp and a first day cover to mark the Pope’s visit issued there were handed over to the Pope by President Sirisena. Following this, a special coin issued by Central Bank of Sri Lanka to mark this occasion was gifted to the Pope by Prime Minister Wickramasinghe. The audience present was then given the opportunity to obtain the blessings of His Holiness.